In writing this post, I am on a bit of a crusade because I have been on both sides of this topic. I have been the gatherer of “stuff,” using reasoning such as: “Someday I’ll use those 600 tissue squares for an art project,” “I feel badly tossing out this four-foot stack of egg cartons, which were gifts from families,” “I don’t know whose this is, but it has been here forever,” “I may never find these items again – I’ll buy a bunch,” or “I just couldn’t part with these boxes and boxes of photos even though they remain (untouched) in the closet.” With my “someday thinking,” in addition to moving part of my home into our child care center (because we “might need these things”), I have been a successful gatherer. Can you identify with any of this? With all of these materials – this “stuff” – however, comes the responsibility of taking care of it, making order of it, maintaining it, storing it, and being vigilant that the “stuff” doesn’t one day overtake the space. I am now on the other side of this topic. I have come full circle and I hope to persuade you to take on this project of de-cluttering your space – for some very sound reasons. Space speaks to each one of us. Long hallways whisper “run” to a child; the smell of baking bread calls us to sit awhile in the kitchen; the grassy hill outside begs us to roll and roll and roll. But, spaces do more than speak. They load our bodies and minds with sensory information, called the environmental load, which is how the amount, the complexity, the flow, and the intensity of environmental stimuli affect our behavior and feelings. We are not all the same. Some people love things around them and are not bothered by many items within their view – colors and shapes bombarding their sensory input. But, for many others, such as children within the autistic spectrum, those diagnosed with sensory processing disorder, ADHD, fetal alcohol syndrome, or even children with dyslexia, a busy and cluttered room may be difficult to handle – and possibly contribute to sensory overload. The busy-ness and clutter adds to their daily struggle to be organized, to concentrate, and to keep their bodies calm and still. A room that is buzzing with visual stimulation may create unwanted behavior in the classroom, and takes away from the child’s learning process. In addition to helping children with sensory and behavioral challenges, an organized, de-cluttered, calm, and welcoming room benefits the rest of the class, and the teachers as well. I have seen this happen over and over again – this positive result. Thus, my crusade for de-cluttering our spaces, which will free up mental space for the staff and for the children in our care – particularly anyone who struggles with a busy internal body. Children and adults who are busy inside their minds and bodies, who have challenges finding balance and calmness due to their biological makeup, will find messy environments and busy walls discomforting. Preschoolers, however, are not able to articulate this, or make the connection between the two. Therefore, we teachers and directors need to be aware – and then act on the children’s behalf. Children who have been diagnosed with ADHD, anxiety, sensory processing disorder, or dyslexia will benefit greatly if they can rest their eyes on a calm colored wall, free of posted “stuff.” In other words, an empty space. Also, if these children know that all the material in their environment has its place and is organized, it will help provide structure and routine to their day – giving them the energy to focus on other tasks. De-cluttering a space helps to ground the people who live within its boundaries. There is good reason and solid research behind “de-cluttering our early childhood environments,” and it focuses our thoughts and energies on the children. If you have read my blog posts, you’ll understand that the rationale behind my decisions and actions as a teacher and director focuses on what is the best practice – for the children! De-cluttering our environments is one such practice. Though my data gathered before and after de-cluttering several early childhood environments is anecdotal, it is compelling. Yes, children visibly calm down in their transformed spaces – teachers do as well; and parents notice the difference. A win-win-win! I have learned that the process of de-cluttering (how you make it happen) and the commitment to doing it are keys to its success, and I have developed a process that has worked in many early childhood programs; specifics on how to do this; a training session to set the stage; and individual coaching with teachers and directors. If you are interested in learning more and/or beginning to transform your environment, let me know. The results will be well worth the effort. This entry was posted in Early Childhood, Early Childhood Leadership, Early Childhood Teachers, Managing Early Childhood Programs, Training for Early Childhood Directors. Bookmark the permalink. 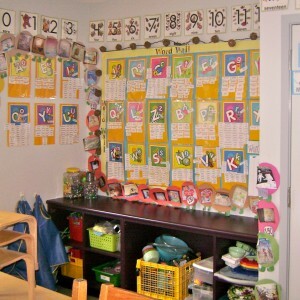 3 Responses to De-Clutter Your Classrooms – For the Children! Kelsey – Happy to help.My best to you – hope all is going well!